2016 has been a tumultuous year for African politics, and next year is likely to be the same. African elections were a mixed bag in 2016. There was the good. In Ghana, a largely peaceful election process heralded a change of power, with opposition leader Nana Akufo-Addo triumphing in his third bid for the presidency. Crucially, incumbent President John Mahama accepted the result, congratulating his opponent after the result was confirmed in order to dispel any possibility of unrest. Then there was the bad. In Uganda, Yoweri Museveni secured his fifth consecutive term in a February election criticized by the European Union and United States as lacking transparency and marred by intimidation. The opposition candidate, Kizza Besigye, was detained at least four times in eight days around the time of the election, and has since been charged with treason after holding an alternative presidential inauguration. And then there was the messy. In Somalia, presidential elections have been delayed three times after clan disputes and insecurity, as the militant group al-Shabab continues to launch attacks in the Horn of Africa state. In Gambia, one of the most surprising stories of 2016 was unfortunately short-lived: The president of 22 years, Yahya Jammeh, accepted his defeat to property developer Adama Barrow, only to perform a U-turn a week later and declare the result null and void. All eyes in the region will be on Kenya, East Africa’s flagship economy, particularly given its fraught electoral history. Preparations for the vote have not been entirely smooth: A series of opposition-led protests against the country’s electoral commission led to the deaths of several people in clashes with security forces. Members of the Independent Electoral and Boundaries Commission (IEBC) agreed in August to resign and the country will have a fresh commission ahead of the vote. But the clashes invoked memories of the 2007 election, when violence broke out after the vote and persisted for several months, with around 1,200 people killed. The main candidates are likely to be the same as in 2013: incumbent Uhuru Kenyatta and veteran challenger Raila Odinga. 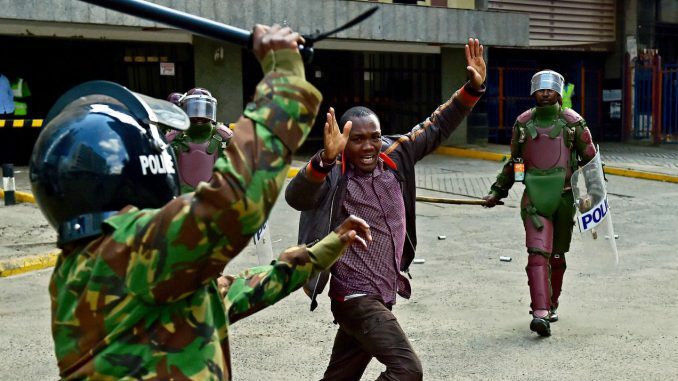 Corruption and security are likely to be prominent issues: A report on economic crime by PricewaterhouseCoopers ranked Kenya as the third most corrupt country in the world, while al-Shabab has continued to launch attacks in Kenyan border towns. Kenyatta has also indicated that the country may be close to exiting the International Criminal Court (ICC), while any new government will also have to oversee the closure of the Dadaab refugee camps that have housed more than 300,000 refugees for more than 20 years. The presidential election in the West African country is likely to be centered heavily on who is not standing. Ellen Johnson Sirleaf, Liberia’s incumbent president and the first elected female head of state in Africa, is stepping down at the end of her second term, as required by the country’s constitution. Hers has been an eventful period in office, She was jointly awarded the 2011 Nobel Peace Prize for her work in helping the country recover from a brutal civil war, and oversaw Liberia’s response to the Ebola outbreak, which claimed more than 4,800 lives and devastated the country’s economy. With Sirleaf stepping down, several colorful characters will be looking to replace her. George Weah, widely regarded as one of Africa’s greatest ever footballers, has announced he will contest the presidency for a second time after being beaten by Sirleaf in 2005. One of those Weah could face is Jewel Howard Taylor, a senator and the former wife of Charles Taylor, the Liberian warlord convicted of war crimes in Sierra Leone in a U.N.-backed court. For 22 years following the country’s genocide in 1994, Rwandan politics has been almost completely synonymous with Paul Kagame. The 59-year-old president was a commander in the Rwandan Patriotic Front, which negotiated a ceasefire to bring to an end the killing of more than 800,000 Tutsis and moderate Hutus by Hutu extremists in the country. Since then, international organizations have credited Kagame with transforming Rwanda from a warzone to a prosperous, stable country. The tiny landlocked country averaged 8 percent GDP growth per annum between 2001 and 2015 and is classed as the second-easiest place to do business in sub-Saharan Africa, behind the island tax haven Mauritius. The country even has the highest female representation in its parliament, with 64 percent of members in the lower house being women, according to the Inter-Parliamentary Union. Human rights organizations have accused Kagame’s regime of clamping down on free speech and not allowing for a robust opposition to emerge: an opposition activist and journalist both disappeared in 2016, while two opposition politicians have been arrested, according to Human Rights Watch. But despite such concerns, it seems that Kagame’s rule will roll on: At the last vote in 2010, the opposition presidential candidate achieved just 5 percent of the vote to Kagame’s 93 percent. As in Liberia, Angola’s vote is likely to be most significant for the retiring president. The ruling Popular Movement for the Liberation of Angola (MPLA) announced December 10 that President Jose Eduardo dos Santos, who had ruled the country for 37 years, had retired and would be replaced by defense minister Joao Lourenco. During his almost four decades in power—prior to his retirement, he was Africa’s second longest-serving current head of state, behind Equatorial Guinea’s Teodoro Obiang—dos Santos built a political and economic dynasty. He appointed his daughter Isabel dos Santos as head of the state oil firm, Sonangol, while his son José Filomeno de Sousa dos Santos heads up Angola’s $5 billion sovereign wealth fund. But according to Simon Allison, an analyst writing for security thinktank the Institute of Security Studies, he may find that the shoes he has to fill are rather large. Dos Santos is popularly credited with ending Angola’s civil war and has built up a cult of personality that has, perhaps, given Angolans cause to overlook some of the less palatable parts of his rule, such as alleged violent repression of political opposition, according to Amnesty International. 5. Democratic Republic of Congo General Election—2017? This one may be more a case of hope rather than expectation. But Congo was due to hold presidential and parliamentary polls in November, ahead of the conclusion of President Joseph Kabila’s second—and final, according to the constitution—term in power. That hasn’t happened. Kabila has claimed that more than 10 million voters are unregistered, and the electoral commission has said the vote will likely be delayed until 2018 at the earliest. The so-called glissement—French for “slippage”—in election dates has angered the political opposition, and street protests have seen scores of people killed, reportedly including more than 50 during clashes in the capital Kinshasa in September. The final date of Congo’s elections are likely to be determined by how Kabila, and the opposition, responds when his second term officially comes to an end on December 19. The country’s highest court has mandated the president to remain in power during a transition period, but an opposition coalition called Rassemblement (“Rally”) has promised further street demonstrations against his continued rule. With a recent survey of 7,500 Congolese finding that three-quarters want Kabila to go before the end of 2016, it will be a challenge for the president to placate his opponents for another year without a chance to vote.